Browning bananas are put to good use in this yummy cupcake recipe. Bananas are rich sources of fiber, potassium, vitamin C and magnesium. They are a healthy and tasty snack that is also good for your heart, digestion and may even help with weight loss and moderating blood sugar levels after meals. If you want to make this into a classic banana bread loaf with frosting, grease a 9 by 5-inch loaf pan with butter or spray with nonstick cooking spray. Bake the banana bread until a toothpick or wooden skewer inserted into the loaf comes out clean, about 45 minutes. Let the banana bread cool in the pan on a wire rack for 10 minutes, then turn the loaf out of the pan and let it finish cooling upright on the wire rack before spreading on the cream cheese frosting. Preheat the oven to 350 F. Line 16 cupcake tins with paper liners, and spray with nonstick spray. In a large mixing bowl, use an electric mixer to combine the bananas, butter, sugar and brown sugar until blended. Beat in the eggs one at a time, then blend in the sour cream and vanilla extract. In a medium sized bowl, mix together the flour, baking soda and salt. Blend in the flour mixture on low speed in three batches just until incorporated. Scrape down the sides of the bowl. Fill each cupcake liner almost to the top with batter. Bake for about 25 minutes, until a wooden skewer inserted into the middle of a cupcake comes out clean. Cool in the pan on a wire rack for 15 minutes, then remove the cupcakes from the tin and finish cooling on the wire rack. While the cupcakes are cooling, make the cream cheese frosting. In a medium bowl blend together the cream cheese, butter and vanilla, add the salt, then add the confectioner’s sugar in a few batches, blending until it is incorporated before adding more. Frost the cupcakes once cool. I don't like this at all. It's not the worst. Sure, this will do. I'm a fan—would recommend. Amazing! I love it! Thanks for your rating! 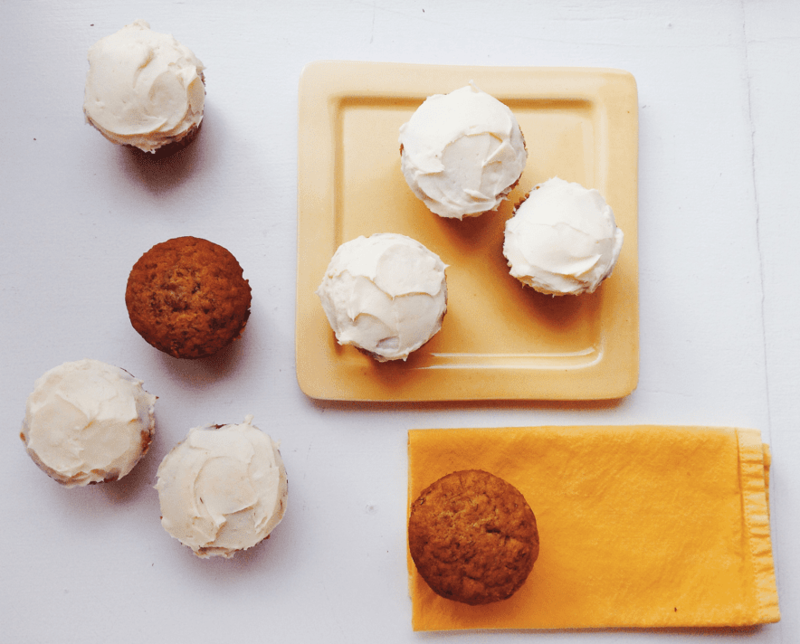 Gingerbread Cupcakes with Cardamom Cream Cheese Frosting! The Perfect Cupcakes For Celebrating Burgers! Looking to make the best brownies ever? Sign up for our newsletter and get our cookbook!